TV is among the easiest hardware to get excited about. The color! The crispness! The detail! New features and capabilities routinely crop up, leading to many of us upgrading sets every few years. The increasing affordability of high quality TVs is certainly no obstacle, and we have plenty of incentive with the new availability of UHD and HDR-compatible sets. Just about every brand is offering at least a few models with the latest and greatest. However, brand still remains the prime signifier of quality. After all, the widest color gamut available will not make up for a dead pixel. Keep reading to learn which top TV brands offer the best quality for your viewing pleasure. There’s little surprise LG receives an A from Consumer Reports. The Korean company is one of the original developers of LCD technology, so there’s a good chance you’re getting LG panel regardless of brand. There is little doubt they keep the best parts for their own products, however. At the forefront of TV technology, LG offers a large assortment of curved, 3D, and 4K UHD TVs. LG’s OLED screens are particularly noteworthy, with the tech giant investing a purported $8.7 billion to develop the technology. Also one of the first brands to offer internet TV back in 2007, LG’s product line includes plenty of features. Most of their Smart TVs are still running WebOS, which LG has significantly souped up since purchasing it from HP in 2013. Viewers can use a number of streaming services, tap into the webOS store, and enjoy DirecTV out of the box. Unlike their national counterparts LG, Samsung is far more likely to outsource their panels. The screens they use, however, typically work fine with their configurations. They have an A from Consumer Reports, and many of the brand’s TVs regularly place in listicles across the net. The brand’s smart TVs are using Tizen, which according to The Verge is shaping up quite nicely. The OS offers some interesting synchronicity, such as fridge touch-displays able to stream whatever is playing in the living room. While most brands offer large scale TVs, Samsung is truly exceptional. The 88″ version seems particularly suitable for a giant yacht or volcano compound. The rest of us can make do with smaller screens, be them UHD, 3D, curved, or all three. Quality costs money, so be prepared to shell out some cash unless you stumble upon a deal. Panasonic’s flagship plasma screens may have gone the way of the dodo in 2013, but the company is alive, well, and boasting an A rating from Consumer Reports. In fact, plasma very well fuels the Japanese brand’s recent unveiling of their very own OLED panels, once the exclusive domain of LG. Times have changed, as only in 2014 Panasonic was in talks with LG about possible supply. Newer to the market, Panasonic is also charging considerably more for their OLED TVs. Director of Panasonic’s TV division claims they are working to make OLED more affordable in the next three years. In the meantime, penny pinchers can browse their selection of HD and UHD sets. Though absent from their OLED model, Panasonic’s smart TVs uses Firefox OS. The brand’s choice is solid, with Firefox offering lots of synergy between devices. Web browsing is particularly more seamless, with users able to share content from their computers and Android smartphones. The second Japanese brand on this list, Sony dominated the 20th century TV industry with their CRT screens. Like Panasonic, Sony is also late to the LED game. For a large part of the 21th century the brand relied on components from Samsung and Sharp. They recently invested close to a $1 billion in a joint manufacturing plant with Sharp, which should make them more independent in the future. For now, Sony’s newest models are strictly premium, making the brand elusive for most shoppers. Those with the cash, however, will find their TVs worthwhile. There are a few benefits to rolling with Sony. PS4 players will find calibration to be much more of a cinch. The brand’s smart TVs, meanwhile, currently run Android. Browsing the web, synchronizing devices, and accessing apps are all easy-breezy. Not all brands offer the same quality or consistency. Those willing to make do with a less than stellar screen have plenty of brands to browse. Some come more at a bargain than others, though pricing can be arbitrary. 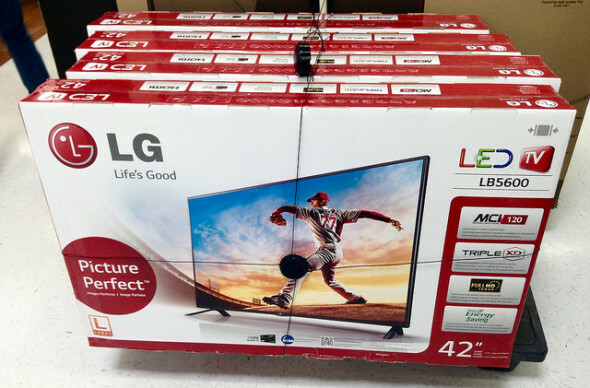 Some outlets even match all their TVs with the pricing of LG, Sony, or other prime brands. Always do some research into cost vs. benefits before making a commitment. Try starting with the below brands, as they offer good middle ground between price and performance. Vizio’s products attract solid reviews and constantly rank in top 10 lists. Often more of a bargain than other brands, Vizio also purchases its TV panels from suppliers that also sell to Sony and Samsung. While the American brand does receive some complaints from their customers, the brand receives a solid B from Consumer Reports. The other brand sporting a B from Consumer Reports, what makes Sharp interesting is that it manufactures and supplies TV panels. In fact, that is what they often do best. Though the brand has a more holistic approach than most its competitors, the company’s TVs are more likely to malfunction than the top brands. Sharp recently licensed its brand name to Hisense, at least in the Americas. How this will affect the brand is anyone’s guess.